Given the state of the world and the country these days, you can awaken one morning and find that when you turn on the faucets all you receive is a blast of air. Anything could have happened; hackers may have finally breeched the computer systems that operate your community’s water treatment plant. Water is obviously essential for survival, emergency or not! The rule of 3 – 3 minutes with no air, 3 days with no water and 3 weeks with no food. one would think that WATER is a top priority for most preppers. The problem is, it often is not. It is often overlooked because we all have such ready access to it nearly everywhere we go. 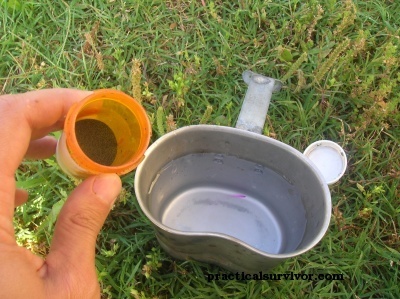 It comes out of our faucet, we can buy it in stores, it’s in lakes, rivers and streams, and it rains… I found a great article that gives you great locations you may find water in a SHTF situation and also ways to treat the water so its safe to drink. This is a great 9 part series of videos on how to make your own water well hand pump from readily available PVC plumbing parts. If you are drinking water from an outdoor source such as a stream or lake, to be 100% sure it is safe, you need to treat the water. Sure, clear running water is more likely to be safer than drinking water from a stagnant pool, but SAFER, isn’t 100% safe. Ideally you should treat all water from outdoor sources. HOWEVER, if, and it’s a big if, the only choice is between dying from dehydration or drinking untreated water, you go ahead and drink that water as that is your best chance of survival. If you are already badly dehydrated you may not last the night, but if you drink untreated water, the bacteria and parasites that it may contain, usually take 24/48 hours to make you ill. The bottom line is – you can die from dehydration in the woods, or you can drink the water, walk out and spend a few days in hospital. Anyway, back to treating water, there are a number of things you can do to make water safer to drink, these range from simply boiling clear water to carrying purification tablets and water filters. The Practical Survivor website has done a great 101 detailing the common water purification options. Check it out below, it is a great read. All you need to make five litres of fresh drink water is five litres of sea water and a sunny day. Simply pour in the sea water in the morning and come the evening, you should have five litres of fresh drinking water. I am guessing that the efficiency of the still is dependant on the amount of sunshine, so it is probably more suitable for warmer climates. I have done a quick search and I cannot see the Eliodomestico Solar Still for sale anywhere, which is a shame, as I imagine it would be very popular with many coastal preppers and folks living off-the-grid. It is however a fairly simple device though, so if you check out the website below for more details, it shouldn’t be too difficult to build your own version if you are a proficient DIYer . It would make a great little DIY project. 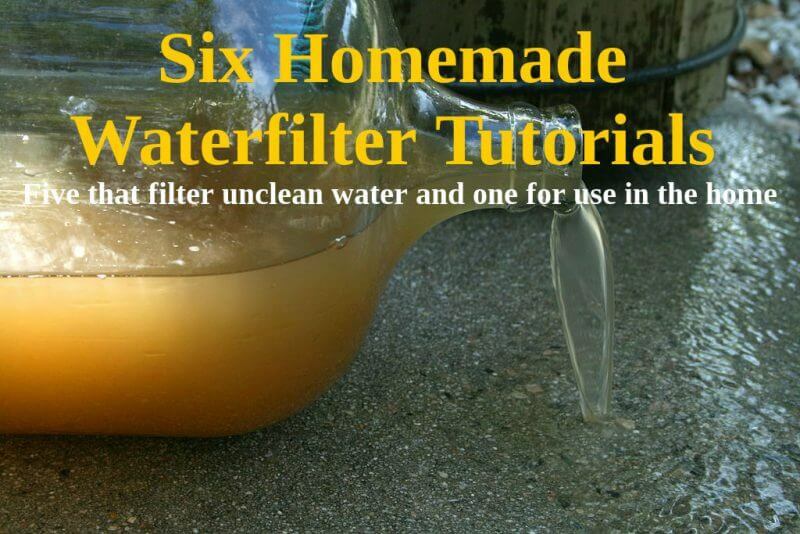 Below are six different homemade water filter tutorials. The first five are DIY filters for filtering rainwater and water from unclean water sources. The last tutorial shows how to make a homemade Berkey water filter for use in the home. This homemade Berkey filter is equally effective but around 75% cheaper! Bio-sand filters are super quick and easy to build homemade water filter systems and they are very effective at filtering dirty water and making it safe. Watch the video for details. A homemade water filter like this would be great for filtering and purifying water stored in rainwater catchment systems. Mechanical trapping. Suspended solids and pathogens are physically trapped in the spaces between the sand grains. Predation. Pathogens are consumed by other microorganisms in the biolayer. Adsorption. Pathogens become attached to each other, suspended solids in the water and the sand grains. Natural death. Pathogens finish their life cycle or die because there is not enough food or oxygen for them to survive. Results for turbidity reductions vary depending on the turbidity of the influent water. Water with high turbidity looks dirty due to sand, silt and clay floating in the water. Feed turbidity in one study ranged from 1.86 to 3.9 NTU. In a study, water was obtained from sample taps of water treatment plants from three local reservoirs. It poured through a slow sand filter and results showed that turbidity decreased to a mean of 1.45 NTU. In another study using surface water, a 93% reduction in turbidity was observed. As the biofilm above the sand ripens turbidity removal increases. Although bio-sand filters do exhibit a high reduction in turbidity, slow sand filters show higher removals due to a slower filtration rate. There is limited research on removal of heavy metals by bio-sand filters. In a study conducted in South Africa, the filter was found to have about 64% removal of iron and 5% removal of magnesium. In laboratory studies, the bio-sand filter has been found to have about a 98-99% removal of bacteria. Over a time period of about two months, it was found that the bio-sand filter may increase in the removal for E. coli due to biofilm formation. The removal after this time period ranged from 97-99.99% removal depending on the daily charge volume and percent feed water amended with primary effluent to the filter daily. The addition of primary effluent or waste water facilitates the growth of the biofilm which aids bacterial die-off. Research in the field shows that implemented bio-sand filters reduce fewer bacteria than ones in a controlled environment. In research conducted in 55 households of Bonao, Dominican Republic, the average E. coli reduction was found to be about 93 percent. Lab tests have shown that while the reduction of E. coli from these filters is quite significant, the attenuation in viruses is significantly less due to their small size. In a study using to bacteriophages, the removal ranged between 85% and 95% after 45 days of usage. A recent study has suggested that virus removal increases significantly over time, reaching 99.99% after a period of approximately 150 days. In one lab test, the bio-sand filter also got greater than a 99.9% removal of protozoa. In tests for one type of protozoa, Giardia lambia had a 100% removal for 29 days of usage. Another protozoa, Cryptosporidium oocysts, showed to have a slightly lower reduction (99.98%) possibly due to their smaller size. This removal showed to be comparable to that of the slow sand filter. After reading this you will never look at that discarded water bottle you find in the woods the same again. In fact, that garbage you are so disgusted with just may save your life one day. How you wonder? Well, the hillbilly DIY water filter is how. A little science and ingenuity is all you need to purify water with stuff you will likely find in the great outdoors. Water that comes from an unknown source is widely accepted as unsafe to drink. You just don’t know what has been put into that water, whether you can see it or not. We are talking deadly bacteria, feces and a variety of other nasty impurities that would do a real number on your body if you ingested them. For that reason, you absolutely must purify the water before you consume it. You must have water to survive. One of the most common ways to purify water is to boil it. Unfortunately, in a survival situation, that is not always an option. You may have some of those handy purification tablets, but again, what do you do if you don’t? 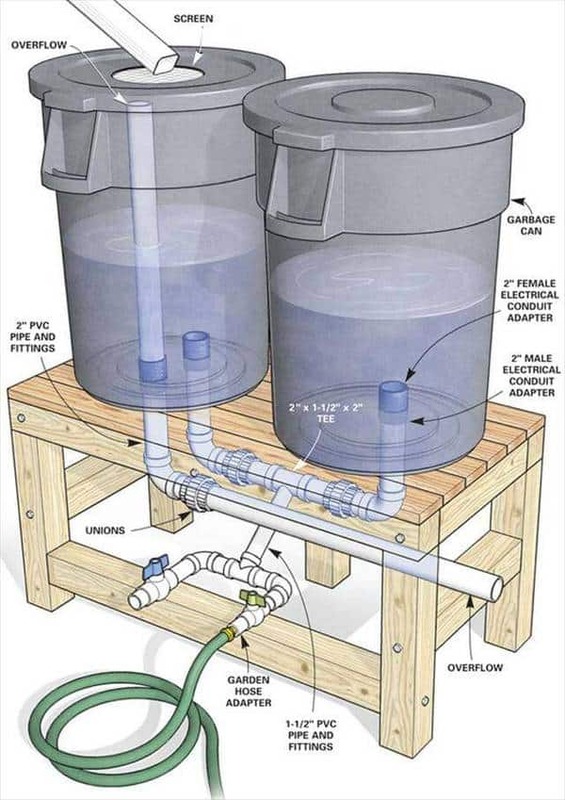 As a last resort, you can use the hillbilly filtering system to get life-sustaining water into your system. You can watch the video and see exactly what I am talking about. Basically, you need a discarded water bottle or plastic pop bottle. Foliage, like edible dandelions and chickweed, will act as a filtering system along with some charcoal material. Remains of an old campfire are perfect for this part of your filtering system. If you happen to be in need of a makeshift water purification system in the winter or in a place where foliage is not around, rocks and sand can be used. While this homemade water filter is relatively effective, do not expect crystal clear water the first few runs through the system. However, it will be safe to drink. If you have the time, run your water through the filter several times to get a clearer product. As I said earlier, this may not be the best system, but it is effective and it will get you what you need to survive until a better purification system is put into place. Craig Caudill is an outdoors enthusiast who regularly shares his knowledge at www.dansdepot.com. He is also the chief instructor at his Nature Reliance School. Ok, I’ll admit, this is a new one for me. I know several methods for making DIY water filters, even one made from the trash you can find in the woods. However, I have never seen such a simple and effective DIY water filter as this one. It’s so simple to make – simply choose the right branch, in this case, they use white pine, securely wedge it in the end of a pipe and you have an effective low-tech water filter. Whilst finding trash in the wilderness is a great shame, it can provide the opportunity for survival in emergency survival situations – soda cans can be used to carrying and boiling water, plastic bottles can obviously be used for transporting and storing water too, but I bet a lot of you didn’t realize that you can also boil water over a fire in a plastic bottle. To find out the correct way of doing this, check out the post below from ‘Willow Haven Outdoor’. But here’s the thing – a quick look on Amazon shows that it will cost in the region of $250-$300 for a family sized Berkey water filter, BUT it also shows that you can purchase a pair of Berkey Replacement Filters for around $55. It is the filters that make the water safe and you can fit these into two five gallon (food grade) containers and add a tap in around five minutes (watch the video!). You pretty much now have a fully functioning Berkey water filter system for the cost of the replacement Berkey filters, a tap and two food grade five gallon buckets, which add up to around a quarter of the price of a complete Berkey system. Note: In the video above Steve is using the standard Berkey filters. When I checked on Amazon, judging from the reviews there is clearly an issue with these at present, so I have linked to the Berkey Ceramic filters as these seem a safer bet at the moment. I am assuming that these ceramic filters will fit in the same way as the standard filters, as they both fit the Big Berkey system. This really is a super simple project and an excellent low-cost way to ensure your family has safe drinking water should disaster strike. With this system, you could filter rainwater collected from a rainwater harvesting system, or rivers/lakes etc. You can pay a company to come onto your land and drill you a well, but it is much cheaper, and way more satisfying to locate and dig your well yourself. Above is a video that explains how to locate and where to drill your well, and if you click here, there’s another video showing how to drill a well by hand.